Send Christmas wishes to your friends and family, clients and customers! 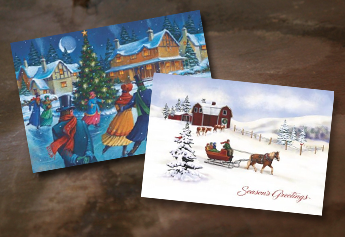 It's Christmas time, mistletoe and wine... and Christmas cards of course! Handing out Christmas cards adds to the caring and sharing part of the year that everyone enjoys. Customise your cards with a personal message and choose from hundreds of free designs, or create your own from scratch with your business logo or theme! 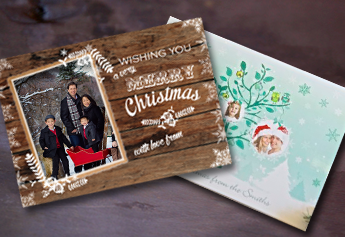 Isn't it expensive to send custom Christmas cards? No, not at all! Our Christmas cards start at just 51p each which is very competitive. This includes full personalisation of the front cover and the inside, free image or logo upload, a smooth coated finish, and an envelope for each card. However it doesn't include VAT. We offer two sizes of cards (203 x 138mm or 127 x 178 mm) in vertical or landscape. This helps us to keep our pricing clear too for our customers when ordering. 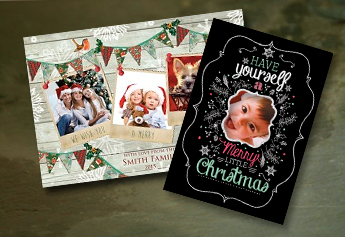 What are the benefits of personalised Christmas cards? Whether you're ordering for your business or your personal use, creating custom greeting cards can help your message to stand out during the festive season. We have many designs that you can upload a photo to, and all cards will accept your business logo on the inside. Continue your branding with a unique personalised Christmas greeting.